The Otto cycle is an idealized thermodynamic cycle proposed by Nikolaus August Otto in 1876. This cycle describes the functioning of a typical reciprocating piston engine (see snapshot 4 or the "engine diagram" button). This thermodynamic cycle is used in automobile engines. This cycle consists of two adiabatic and two isochoric transformations. 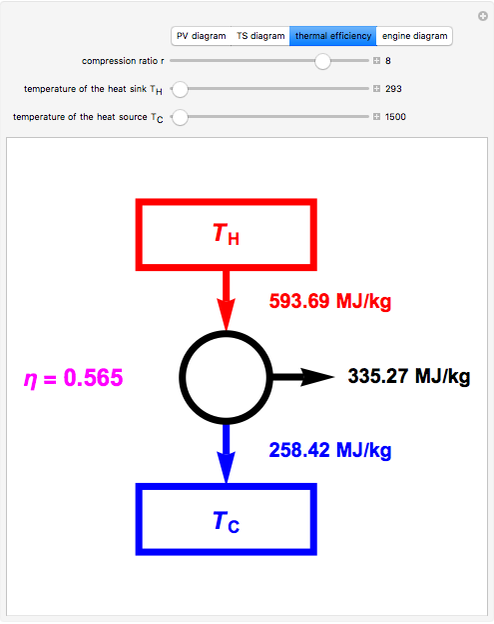 The thermal efficiency of this cycle is given by: , where is the compression ratio and is the specific heat ratio, taken to be 1.4 for air in the present Demonstration. 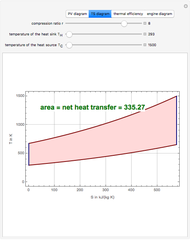 This Demonstration plots the four transformations in the PV (i.e. 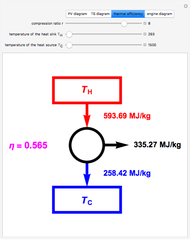 pressure vs. volume) and TS (i.e. 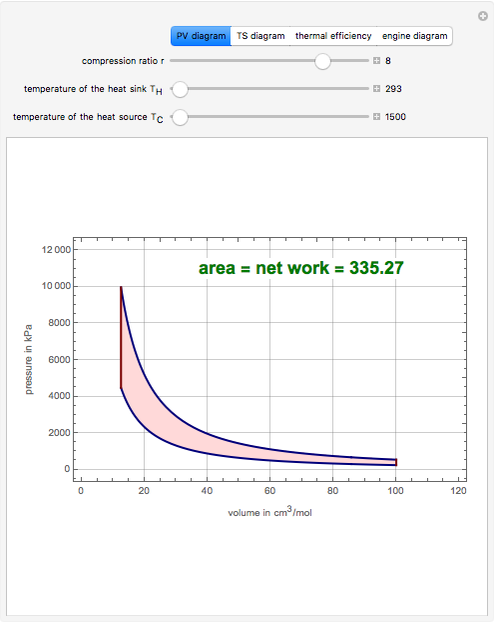 temperature vs. entropy) diagrams. The adiabatic and isochoric transformations are shown in blue and red, respectively. 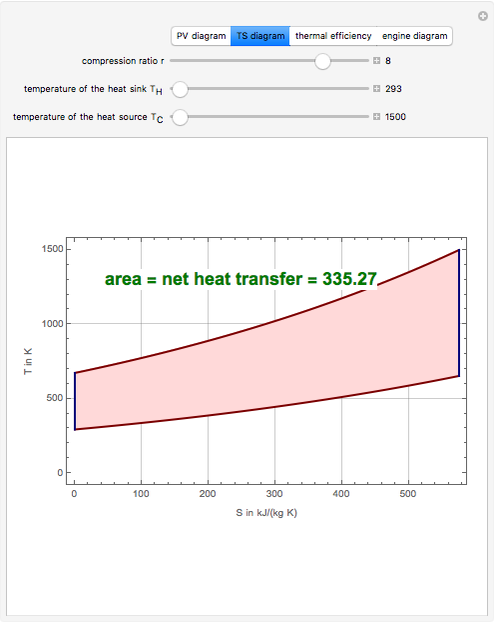 The areas shown in the PV and TS diagrams are equal to the net work and to the net heat transfer, respectively. These two quantities are equal. 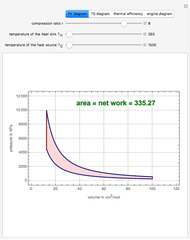 You can set the values of the heat source temperature, the heat sink temperature, and the compression ratio. 1. Air and fuel are mixed and compressed adiabatically. Work is thereby performed on the system (i.e. the gas). 2. A spark ignites the mixture leading to an explosion. A rapid rise in the pressure and temperature occurs. The process is idealized as a constant volume process. Heat is absorbed by the system in this step. 3. The explosion is followed by an adiabatic expansion producing a force on the piston. Work is performed by the system. 4. After the working stroke, there is still some residual pressure in the cylinder. This pressure is released by opening the exhaust valve. The drop in the pressure occurs at a constant volume, so that heat is released by the system to the surroundings.